The number of trekkers increases day by day as new suitable places for trekking are discovered regularly and mostly unheard of remote locations, untouched, where adventure becomes synonymous with the place names. In India does not require any official introduction since there are millions of people do trekking every day regardless of time. The geographical features of India are unique which help trekking grow from height to height. It’s good for your spirit, It’s excellent for your health. You can see amazing sorts of landscapes and beautiful views. You will meet kind and interesting people. It is going to be the greatest experience in your trip, and maybe in your whole life! The full concept of “trek” is something we don’t really meet in our regular western way of traveling. So, it is still nothing like trekking particularly in the hill region we are going to speak about here. Kerala has unique natural features made up of emerald green valleys, misty hill stations, lush eco-tourism locales, refreshing waterfalls, numerous rivers, a network of lagoons, natural harbors, jungles with exotic flora and fauna, and more – all of which remain evergreen attractions to the travel addict. Rajamalai is a small hill station located inside Eravikulam National Park on Munnar – Udumalpet Road. The trip to Rajamalai is one of the top things to do in Munnar and also another popular attraction not to miss in a Munnar tour package. This area is famous as the natural habitat of the endangered Nilgiri Tahr. Nearly half the world’s population of this rare species is found in the area. Many other faunal species found in the park are elephant Gaur, Giant Squirrel, Leopard, Lion-Tailed Macaque, Tiger, and Sambar. The national park is occupied around an area of 97 sq km and is a protected area. The national park is divided into 3 regions – the core area, the buffer area, and the tourism area. Visitors are allowed only to the tourism area, which is in the Rajamalai region. Visitors can take safari and trekking tours inside the park. Entry to the park is adjacent to Munnar – Udumalpet main Road. Private car or vehicles are not allowed into the park and visitors can park the vehicles at the entrance and board forest department minibus. The ride for the bus tourists into the sanctuary and stops at the base of the Eravikulam peak from where a 2 km walk will lead to the mountain peak with the viewpoint which offers the panoramic view of the Anamudi Peak and other peaks of the Western Ghats. A lot of Nilgiri Tahrs can be spotted on the peak and on trekking path. The safari ride is usually crowded and it’s advised to reach there early in the morning. Advance reservation counter is also available where Rs.50 extra can be paid instead of standing in the very long queue. Top Station is a breathtakingly beautiful place on Kerala – Tamilnadu border. From the top station. one can get 360 degrees view of the Western Ghats. It is one of the best Munnar tourist places and among the prime place to visit on a Munnar tour. At an elevation of 2200 meters, this place is also known for the Neelakurunji plant, which flowers only once every 12 years (next flowering year is 2018). The viewpoint is at a distance of 2 km from the road point and has to be trekked down. The trekking path is very steep with deep valleys one side. One should be very careful while trekking to the viewpoint, which offers lifetime memories. This place is the highest approachable road in South India. Viewpoint from Top Station offers breathtakingly beautiful views of Kannan Devan Hills. It is surrounded by valleys, the misty mountains and distant waterfalls all make this place a must-visit spot in Munnar. 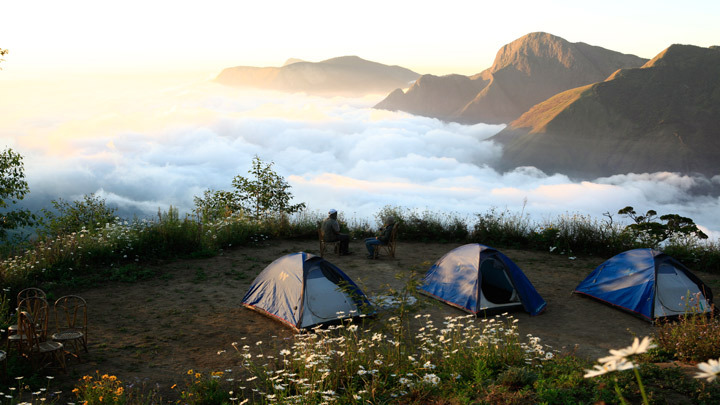 It is also a wonderful trekking destination in Munnar. There are multiple trekking routes in Top Station. The familiar route starts from Kurangani, a small village in Theni district of Tamilnadu. The distance from Kurangani to Top Station is about 9 km and it usually takes around 6 hours to complete the trek. Camping is also allowed on the trail if an overnight stay is preferred. This trek is of moderate difficulty with a well-marked path. Other trekking trails start from Top Station and run through Pampadum Shola National Park and end up at Vattavada in Kerala or take a diversion to Kilavarai / Kavunji is known as Kerala – Tamilnadu border trail. This trail is a part of the protected area and taking permission at the check post at the entrance of Pampadum National Park (after Top Station) is mandatory along with payment for trekking permission. Accommodation facility on this is also available at forest hut on the trekking route. This trail is a little difficult and prior trekking experience is suggested to participate in this. Agasthyakoodam is a hill range in the Western Ghats at an altitude of 6201 feet above the sea. Agasthyakoodam is the second highest peak in Kerala after Anamudi near Munnar. The hills are revered by both Buddhists and Hindus, as it is believed to be the abode of the Bodhisattva Avalokitesvara as well as of the sage Agastya, a disciple of Shiva. 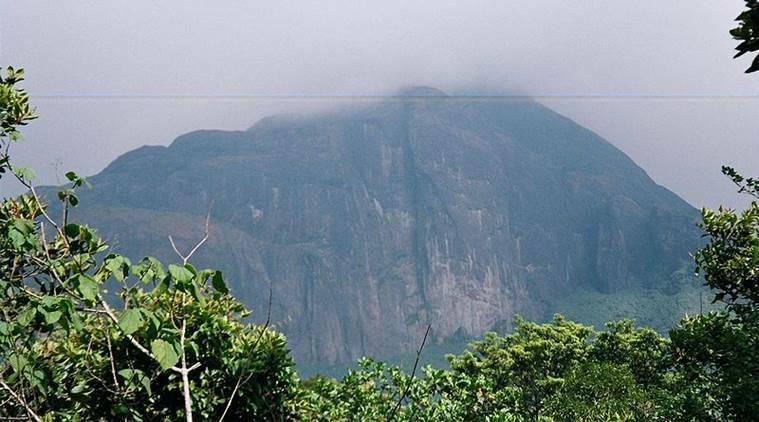 The mountain range is now declared as Agasthyavanam Biological Park covering an area of 23 sq. km. Also, it is the source of River Kallar. Actually, there are two routes to trek the peak of Agasthyakoodam, one from Kottoor near Neyyar Dam and other one is Bonacaud. The total trek distance is about 28 Kms and takes 2 days. The Prior forest pass from the Neyyar Wildlife Sanctuary is required to enter the forest. Treks are arranged with a guide for an overnight stay at the camp inside the forest. Thusharagiri is also known as ‘snow-capped mountains’. Two rivers originating from the Western Ghats meet here to form the Chalippuzha River. 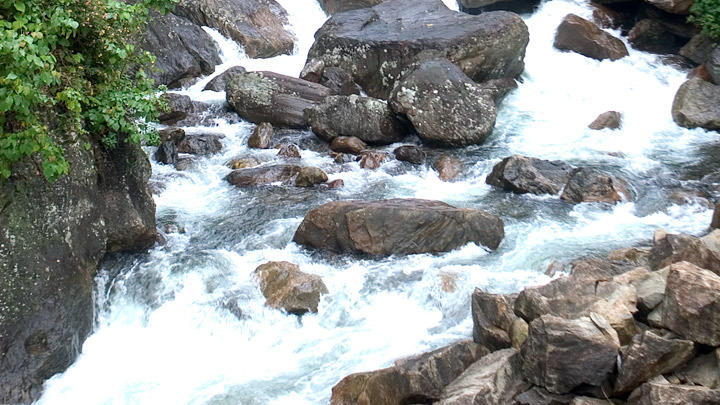 The river separates into three waterfalls creating a snowy spray, which gives the name – Thusharagiri. One waterfall can be reached easily while the remaining two falls can be reached from the first one by trekking through the thick forest. It is also known as the ‘trekker’s paradise‘, the place offers challenging trekking and rock-climbing opportunities. The trekking path from Thusharagiri to Vythiri in Wayanad and it is not for the faint heart. It is an ideal destination for both nature lovers and wildlife enthusiasts, this Thusharagiri waterfall is also a great picnic spot as well as a nice romantic retreat. The trek to Thusharagiri is around 2-3 hours will begin around 7 am and lead you to explore the areca nut, rubber, and spice plantations; Don’t forget to visit the exotic birds along the way! Comfort stations, Tourist cottages, Parking space, and a Cafeteria are facilities that have opened up recently.